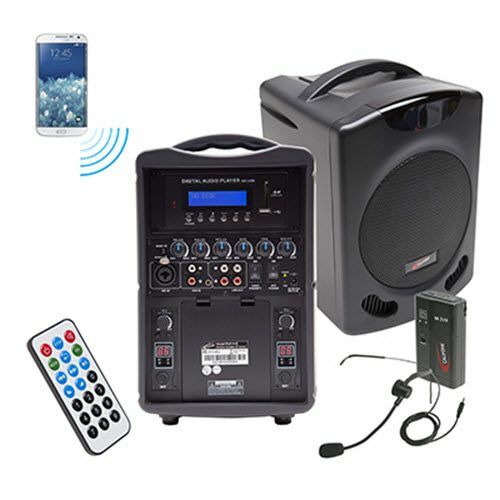 Catalog Home > Califone International, LLC > PA419-02M Portable PA w/ Wireless Head Mic. PA419-02M Portable PA w/ Wireless Head Mic. The PA419 has an industry first Apple®-approved docking station – so you can stream content directly from your iPhone or iPod or listen to previously recorded audio from the built-in DVD/CD player. Whether you use it indoors or out, its robust sound easily carries in rooms up to 2,000 square feet or in a gathering of up to 300 people. The PA419 can also be hooked up to a computer and a projector for multimedia broadcasts to support individual or group presentations on campus or off. Includes M319 beltpack transmitter & HBM319 mic. In addition to accommodating two presenters with wireless mics, the PA-419 has an input for a wired mic allowing a third presenter to participate, making this ideal for school wide presentations. It also features voice priority capability so the music will stop while announcements are made with either the wired or wireless mics. Once the announcements are concluded, the music will automatically return to the same level as before. The PA419 runs on AC power or its rechargeable battery, plays for at least 2 hours on a single charge and even fully functions when it's recharging. Since presenters and teachers prefer the flexibility to move around during lectures, the PA419 comes with a remote control that includes pitch adjustment for audio played from the DVD/CD player, making it ideal for dance and music teachers.